I'm a 32 year old woman living in the Northern California Wine Country town of Santa Rosa (about an hour north of San Francisco). I ride bikes for both utility and recreation. I stick to road biking/commuting. One day, when I was 29, I decided that I'd like to try to ride a bike again even though I hadn't been on a bike in well over 20 years. I went the cautious route and bought a beat up Trek mountain bike through Craigslist just to see if I'd like riding. Of course, I totally fell in love. It's now 3 years later and I have since traded in the beater mountain bike for a Trek FX 7.2, and more recently a Fuji Sportif. I use my Trek almost daily during the spring and summer seasons to bike commute and to run errands, as well as for recreation rides on park/bike trails, for bike camping adventures, and have even ridden it for several metric century rides. 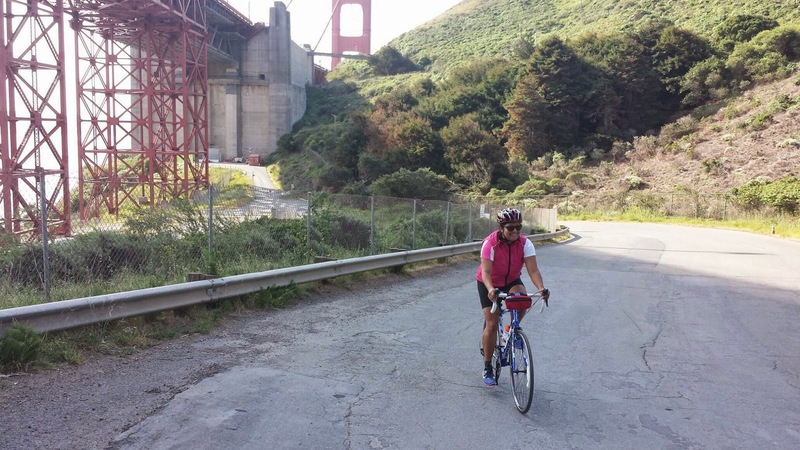 I blog about my cycling, hiking, backpacking, and running adventures at rosieonthemove.wordpress.com. I’m infrequently on Twitter @roselovescajeta. Like a lot of people, I first started riding a bike when I was a kid, but it was never a consistent thing. I totally stopped riding bikes when I was in the 4th or 5th grade, though I don’t really remember why I stopped riding. I got back on two wheels a few years ago, when I was 29. At that time, I lived in Chico, CA, which is a really big bicycling town. Seeing people cruising through town motivated me to want to ride a bike again. Being the cautious person that I am I didn’t want to spend a lot of money on a bike in case I totally hated riding, so I bought a beater Specialized Hardrock off of Craigslist. I shouldn’t have worried though, because I instantly fell in love with riding. My motivation for riding comes from the feeling of freedom that riding a bike gives me. It puts me in a great frame of mind, makes me happy, and has turned my everyday into a daily adventure! What inspired you to participate in events and which would be your favorite? I love the energy of participating in cycling events. I like meeting other cyclists, sharing the road with them, and just being around the energy of folks on bikes. Though I haven’t participated in too many organized bike events, my favorites have been supported charity rides in the metric century distance. I enjoy road cycling for both utility and recreation. I love road cycling because it allows me to do everything bike commute, run errands, explore the areas around me, and exercise. I love the perspective of seeing life from atop two wheels vs. behind the wheel of a car. 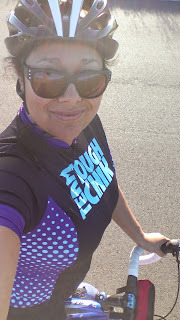 I HATE to drive, and cycling has allowed me to spend a lot less time behind the wheel of a car, so much so, in fact, that a few years ago, my husband and I downsized from two cars to one. Why do you enjoy commuting by bike? I love that I’m reducing my carbon footprint, saving money, exercising, and creating adventure out of the mundane, all at the same time! Do you have tips/suggestions for those new to commuting? Don’t feel like you need to wear a full cycling kit when bike commuting! If your commute is just a few miles, it’s likely you won’t be riding so hard that you’ll end up sweaty and disheveled looking. It’s easier to just wear your regular work clothes in that situation. My commute varies in length, depending on whether I’m going the full distance (see my second tip, below). On my short commute days (6 miles), I wear my regular work clothes. I work in a business-casual environment, so my outfits usually consist of some kind of slacks, a blouse, and cardigan. I’m lucky to live in a part of California where the weather stays mild most of the year, and where I don’t have to contend with snow in the winter, but when it does drop to the 30s, I throw a couple of extra layers over my work clothes. This strategy can work for most people. On days when I choose to ride the full distance to my workplace, I do wear bikespecific shorts or tights with some kind of tshirt and/or jacket, depending on the weather. I then change when I get to work. I do like to wear sneakers on my commute, even when I wear regular work clothes, so I leave a pair of dress shoes in my desk so I don’t have to carry them back and forth between work. Don’t feel like you have to ride the whole way! I live about 15 miles from my workplace. During the fall/winter/early spring, when the days are short and the temps are cold, I don’t want to have to ride in the cold and dark for 15 miles. Instead, I ride 6 miles to the transit center in my city, and I take the bus the rest of the way. The last thing I would say to anyone who is new to bike commuting, or thinking about giving it a try, is to try different things out! I’ve found that bike commuting is not a “onesize fits all” endeavor. What works for one person, may not work for you. Try different routes, different clothing strategies, and different ways to carry your stuff. I feel like people often think that bike commuting is too much of a chore. I honestly feel like if it feels like too much work, you haven’t found the best way of doing things for you. Once you figure out what works best for you and your commuting situation, it really does become second nature and doesn’t take a whole lot of extra effort. I’m pretty lucky in that I’ve had only one minor accident, back when I first got back into riding. I was crossing through an intersection, and my chain slipped. I was thrown into the middle of the intersection and tore up my knee pretty badly. Thankfully, it was pretty early and there was not very much traffic. A fellow cyclist stopped to make sure I was ok, and helped me move my bike onto the sidewalk. It was definitely a scary experience to go through, and it took me a few weeks to get back on the bike. Eventually, I asked myself whether it was scarier to have eaten sh*t or to never bike again. It was definitely the latter! Recently, my most challenging situation has been contending with the traffic along one of my commute routes. There is a certain stretch of road where I’ve come pretty close to being hit by a car about 4 times in after work traffic. Unfortunately, this road is unavoidable and the only road I can take to get home. After being really shaken by the experiences, I started to wonder whether I should even continue commuting. The thought of not riding to and from work really got me down, so instead, I got creative. Now, rather than continue riding on that stretch of road or giving up on commuting altogether, I hop on a bus for 5 minutes and avoid a dangerous road while still being able to bike most of the route. I first heard about Team Tough Chik back in 2013, probably through a blogger or via Twitter. I loved the idea of an inclusive group of women supporting one another’s athletic endeavors. Almost none of my friends are into athletic pursuits, and I really wanted to become part of a community of people who shared that interest, and who were actually interested in and excited about talking about things like gear, racing, training, etc. Being involved with TTC has motivated me to want to step outside of my comfort zone in the activities I’m involved in. I love seeing people pushing themselves because it helps me to push myself too! Everything! Seriously. There is nothing bad about riding a bike. I love cycling but my biggest passion is backpacking! There’s nothing more amazing than propelling your body with just your feet over mountains, across deserts, along coastlines, and through other gorgeous landscapes, with nothing more than the basic necessities strapped to your back. I have a Trek FX 7.2. I choose it because, as my first bike, I wanted an affordable bike that could lend itself to different types of cycling. I love this bike! It has served me well in so many different ways. As I started to figure out what kind of cyclist I am, my Trek has been there every step of the way. It is my daily commuter; I’ve ridden it in a couple metric century rides, taken it bikepacking, and taken it all around town on countless adventures. Last year, after figuring out that I like riding longer distances, but wanting something a bit speedier than my Trek, I bought a Fuji Sportiff road bike. I chose it, honestly, because I was able to get a great deal on it! I wanted to try out a road bike but I didn’t want to invest a ton of money into it, in the event that I hated it. It’s definitely different than riding my Trek, and I’ve had to adjust to the way it handles, but all in all, I’m enjoying the way it rides. I’m not too picky when it comes to bike clothing. I have a couple of basic bike shorts but I don’t love any one more than the others. I do love my Team Tough Chik bike jersey because it’s comfortable, flattering, and just plain awesome! Bike accessories are a little different. I love my Niterider Lumina 380 headlight because it lights up the road really well during early morning and nighttime riding. I also love that it’s rechargeable via a USB cord, so I can charge it at work after my morning commute. For hauling stuff, I love my Seattle Sports Rain Rider Pannier. Each pannier holds a ton of stuff and is waterproof. Though I don’t often commute in really rainy conditions, I live in an area where it is foggy during the morning, almost year round. The fog creates pretty drizzly conditions and the Rain Rider Pannier keeps my stuff nice and dry. On days when I’m not hauling a lot of stuff, I forgo the pannier in favor of a backpack. After trying a few different options in the last year, I’ve finally settled on the Timbuk2 Candybar Backpack. I love that it is roomy enough to hold all of my stuff, but doesn’t feel very big on my back. I also love that it has a flat bottom! I bring my lunch (and often my breakfast and countless snacks) to work, and having a flat-bottomed backpack has really come in handy because it ensures that my containers sit flat on the bottom and don’t leak. I think one of the biggest things that deters women from getting into cycling is not knowing other women who are into cycling. If you don’t know other ladies who bike commute or cycle recreationally, it can be challenging to hunt out resources to learn more about cycling. Also, I think it can be intimidating, as a women, to venture into a male-dominated bike shop to ask questions, because you might feel like you are being dismissed or condescended to. That was certainly my experience when I started to shop around for my first bike. I think it’s important for women to create community for themselves within the cycling community to support and encourage one another! This is happening more and more, which is great, but it’s still not enough. As a woman of color, I think it’s really important to build the resources and support to encourage women of color to ride. My mom! My mom was raised in Mexico, and as a Mexican woman, her cultural upbringing discouraged her from participating in most active pursuits. She has always lamented the fact that she wasn’t allowed to learn to ride a bike when she was a kid and now she feels like she’s too old to learn. I never want any woman to experience this!